PediniLA has a showroom in West Hollywood, California that they were recently renovating. They wanted exterior signage that looked modern and inviting while conveying what the business offered. 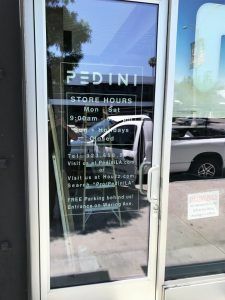 Their showroom in Los Angeles is one of many locations that Pedini has worldwide. They create world-class kitchens so for those who aren’t familiar with the company, they wanted to add a few more details of the business services to the outdoor windows. They had an existing storefront sign that needed to be replaced. Instead of making another typical storefront sign, they decided to use the vast window space they had. 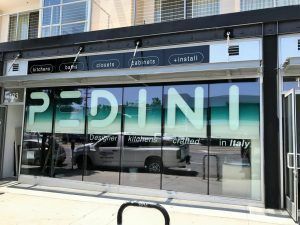 Coincidentally, they had the same number of windows as the name of the company, “Pedini”, so they had the idea to use each window for a letter. They knew what they wanted, the next step was deciding how they wanted it to look. We started with mocking up large vinyl letters in each bottom window. The smaller windows above were to display services they offer like full kitchen renovations, baths, closets, cabinets, and installation. First we had everything in white with the middle bar in “E” one of the company colors. Then we added “Designer kitchens made in Italy.” and played around with how it should look. To add a little more color, we added a background color that would be digitally printed onto clear vinyl and installed on top of the letters. We went through a lot of different color combinations and backgrounds, but we finally landed on a two-tone graphic with a gradient background. They also wanted to add some information to the door along with the suite number. With any sign, renderings are necessary if you want to make sure that the sign that is being designed will work well with the space it’s going onto along with the things that are around it. It’s hard to imagine how lettering will look on a glass door and how easily you would be able to read it without actually seeing it. We went through a few proofs changing the information, the size, boxing things, and unboxing them. The end result was a simple cut white vinyl graphic with the company logo, hours, contact information, and parking information. Adding the parking information was a great idea especially in an area like West Hollywood where finding parking is difficult, let alone finding free parking. The window graphics look great and definitely achieve the look that they were going for while using the space they have wisely. Check in next week when we’ll go over the interior signs we made for their showroom.